"Come April 1st, the Roundabout Dog starts touring Europe. 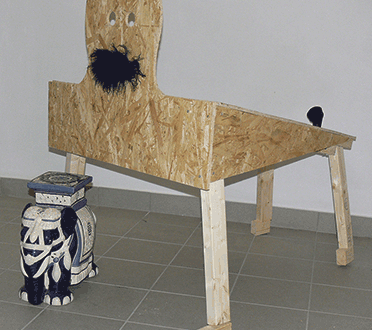 Based on a design by the Swedish artist Lars Vilks, the organization Freespeech Europe has build plywood models of the dog, which will pay surprise visits to a variety of European cities. “Due to security concerns, we cannot disclose our tour plan, but the Roundabout Dog was always about surprise, so we will continue in that spirit,” says Hans Erling Jensen, the initiator of the project. The Roundabout Dog was a form of street art that appeared in Sweden during the year 2006. It started with the art installation Cirkulation, placed in the Nygård roundabout in Linköping, Sweden, a white dog staring at a hula hoop nine meters tall. When someone sawed the head off the dog, the artist Stina Opitz was given the task of creating a new dog, this time made out of metal. It is not really known why the Swedes then started to mass manufacture roundabout dogs, to clandestinely place them in all kinds of traffic circles. It became a moderate-sized public movement during the next few years. “We plan to visit seven countries: Sweden, Denmark, Norway, Germany, Austria, the Netherlands and Switzerland. It is our hope, of course, to start discussions about freedom of speech. Do we Europeans really want the artists to continue their self-censorship, or do we want a society where everything can be criticized and made fun of?”"